Around the time of the visit of Shell’s pipe-laying ship the Solitaire in June it became clear that the Gardai had been told that they could do anything to remove Shell to Sea campaigners from the scene and they would be looked after. Rulings from the district court, in particular the denial of bail to 7 campaigners charged with the most minor of public order offences removed people with vital water skills from the area by interning them in Mountjoy and Castlerea prisons. Local fisherman Pat O’Donnell had one of his boat sunk from under him when four masked men boarded the boat in the middle of the night and held Pat and the other crew member at gun point while they sabotaged the boat leading to its sinking. When Pat took to sea in another boat as the Solitaire arrived he was arrested under the Public Order Act for loitering and once more sent to prison leaving the way clear for the Solitaire. What happened in Erris in the spring and early summer of 2009 reads like some sort of B Movie film script. First news arrived that one of the security guards who worked for Shell had been shot dead in Bolivia and that he was part of a terrorist group that aimed at starting a civil war there. Within weeks it became clear that he was not alone, that in fact several security guards from the Shell compound had traveled to Bolivia with him where some were arrested and others are wanted for questioning. The environmental prize winner Willie Corduff was beaten by masked men while conducing a peaceful overnight sit in at the Shell compound. Then Pat’s boat was boarded and sunk by more masked men, an event the Gardai failed to investigate for weeks. Finally as Shell’s pipe lying ship the Solitaire arrived off the coast two Irish Navy gun boats were deployed alongside a Air Force spotter plane, 300 Gardai and 200 Shell private security. All to watch, surround and repress no more than one hundred Shell to Sea campaigners. Rumors abounded of unmarked military jeeps and everywhere secret police men were to be seen. A huge media smear campaign swung into action seeking to paint the Shell to Sea campaigners as crazed terrorists despite the facts that showed such types were to be found on the other side. The reports we published as this struggle developed must have seemed the stuff of paranoid conspiracy for readers who are not familiar with the way energy corporations work. Of course some of the facts were all too visible, pictures of a bullet riddled Michael Dwyer on the floor of a Santa Cruz hotel room appeared in newspapers around the world. On this site and on the Shell to Sea sites photographs were published that showed the huge security deployment. Images of people sitting around a campfire on the west coast while a mass of ships and boats were visible in the background or dozens of Gardai lining a rocky beachfront. But still many believed that all that smoke must mean a fire was burning somewhere, that the Gardai would not simply randomly arrest over two dozen people in the service of a multinational energy corporation. This week saw a special sitting on Belmullet district court set up to clear the cases of the 27 people arrested in that period, many of whom were initially denied bail and jailed. Yet despite the fact that this was a court of the same state that has backed Shell to the hilt the evidence presented by the Gardai in the prosecution was so weak and contradictory that in 25 of the 27 cases the cases were either withdrawn or thrown out. Seven of these campaigners spent either 3 or 4 nights in Mountjoy or Castlerea prison respectively after they were arrested for being in the area of a road blockade, a very minor public order offence. Gardai must have been aware that these people were from a very limited number of people that had the skills to take Kayaks into the sea, arresting them prevented them from doing so. At the time they were taken in front of Judge Mary Devins, wife of ruling party Fianna Fail Minister Jimmy Devins. She may or may not have known the campaigners in front of her had key skills. But she not only denied them legal aid, proclaiming that “Legal aid can no longer be dished out like smarties” she also refused these seven bail, sending them to Mountjoy and Castlerea jails until the Shell to Sea campaign could get her rulings overturned by the High Court. On releasing the three men jailed in Catlerea Judge Geoffrey Browne stated that the “Objection to bail was a pure waste of time and money.” The judge in the case of the four women in Mountjoy went so far as to wish them ‘the very best of luck’ after he ordered their release. Clearly these judges could not see sense in these jailings but perhaps they were unaware of the desperate need of the Fianna Fail and Green Party government to crush protest back in June. Today Judge Gerard Haughton ruled that one of the seven, Shell to Sea campaigner Eoin Lawless, was “unlawfully detained,” further vindication of our contention that Gardai were simply seeking to repress protest by any means, regardless of the law, in the service of Shell. 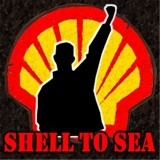 As part of the massive operation against Shell to Sea campaigners, which cost the state millions, these campaigners were in effect interned by being imprisoned without bail on the most minor of charges, charges that the courts have now dismissed. The only conviction obtained by the state in the 27 cases heard this week arose from an incident at the court hearings rather than the protests against Shell’s experimental gas pipeline. And even in that case the Judge admitted in ruling that the prosecution had given contradictory evidence. In the case of James McBarron video evidence contradicted the testimony given by several Gardai. On the first two days of the special sitting of the court three other campaigners were found not guilty of charges brought against them: Maura Harrington on Monday, WSM member James McBarron (on three separate charges) on Tuesday and Eoin O’Leidhin also on Tuesday. Today cases against 6 residents who removed nets Shell had placed to prevent the annual nesting of endangered Sand Martins were dismissed as were the charges against ex-fisherman Noel Philbin and resident PJ Moran. All nine people charged for the lock on that blocked the road in front of a Shell convoy in June have had their cases dismissed. Other campaigners had their charges withdrawn before the court case, 10 cases were withdrawn today leading Shell to Sea spokesperson, Maura Harrington to ask “why were most of these cases proceeded with for many months and then dropped at the last minute? .. is this an attempt by the State to discourage peace protest and intimidate campaigners who oppose Shell?” As Maura herself has already seen the inside of Mountjoy on four occasions we suspect the question was rhetorical. Another Shell to Sea campaigner interned during the Solitaire’s visit was fisherman Pat O’Donnell. He is now approaching 50 days in Castlera prison. Shell to Sea have called a national protest for Castlerea Prison on Saturday 27th March at 15:30 to highlight his unjust treatment. He was jailed for 7 months after being found guilty of an alleged “breach of the peace” and allegedly “obstructing a Garda” in a separate incident in February to that he was interned under in June. Why is the government and Shell going to such desperate measures to repress protest? Because protest has been effective! Shell had hoped to complete its experimental pipeline by 2003, now they are talking of a completion date towards the start of 2013, a decade later. The long resistance, now a decade old, has awoken people to the Great Oil & Gas Giveaway. This is the label increasingly in common circulation for the process by which the government, including Minister Ray Burke (later jailed for corruption) changed the terms of energy exploration licenses so that energy companies now pay no royalties and very little tax in comparison with any other country in the world. With an estimated 420 billion of oil & gas off the west coast of Ireland alone the profits for the game the energy companies are playing are enormous. Elsewhere in the world they have encouraged governments to murder their own populations for similar and lesser sums of money, why would we expect different behaviour here? These court decisions demonstrate the lie of that old cliche. If it is possible to have what has to be a wide ranging conspiracy within the Gardai to de facto intern people that they think are key campaigners than the existence of something similar within the Irish media should not be a surprise. All the more so when you consider that most of the media is either state owned or is owned by wealthy families with direct links to energy exploration themselves. And this is not just about what the state is doing to the relatively small number of people with the courage to fight on. The billions that Shell are going to take out of the economy are billions that could otherwise be spent of education, health, community services and job creation. In that context the successful repression of the protests would mean the loss of special needs teachers, the closure of hospital wards, the slashing of community services and continued unemployment. As such it affects every ordinary working person in the country, all those of us who are not tax exiles with access to the Blackrock clinic. It is in all of our interests to fight the Great Oil & Gas Giveaway and stand with the people of Erris.